AC mains (220V) UHF bug spy transmitter concealed inPower Strip Extension 1.5m White 2 Way. NO GSM! Home>Room Transmitters>* Room Bugs FM UHF>Bug Spy Wiretap UHF Power Strip Extension 1.5m White 2 Way. NO GSM! Bug Spy Wiretap UHF Power Strip Extension 1.5m White 2 Way. NO GSM! AC mains powered (220V) UHF POWERFUL Bug Spy Wiretap Power Strip Extension 1.5m White 2 Way. NO GSM! . It will transmit conversations to a distant receiver. AC mains powered (110-220V) Transmitter Bug Spy Wiretap UHF Power Strip Extension 1.5m (White) 2 Way. NOt GSM! It looks like an innocent Power Strip Extension found almost in any house, hoever it is not so innocent... Directly connected to AC power line it will transmit conversations to a distant matchingreceiver. It doesn't use any battery, gets its power from the outlet. Easy and simple connection to a power line, 220V. In spite of its microphone dimension (only 4mm), it is very sensitive and allows catching even feeble whispers in tens of meters away from it (in closed areas). The UHF-EXT transmitter is adjusted to 433.x MHz, quartz crystal controlled, fixed frequency. It doesn't use any battery, infinite transmitting time. The antenna is internal connected - less observed. 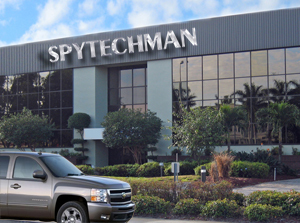 Safety: Our unique transmitters are using a patent pending material for encapsulating, for safety and security. It is a special most important feature for your safety, as in case of emergency it'll extinguish itself. Audio: Internal microphone (gold). High level difference between noise and the transmitted sounds. Its tiny condenser microphone (only 4 mm diameter, gold coated) is so sensitive, covering up to 100 sq. meters (120 sq. yard) around , crystal clear. You won't miss any whisper. 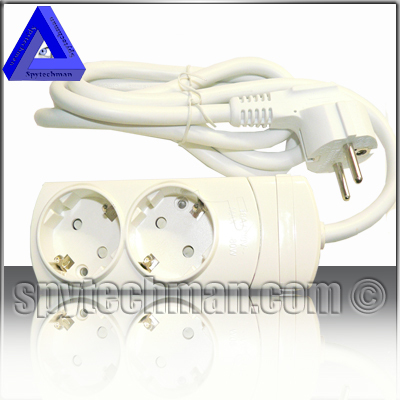 1 X Micro mains operated transmitter concealed in European Power Strip Extension 1.5m White, 2 Way.